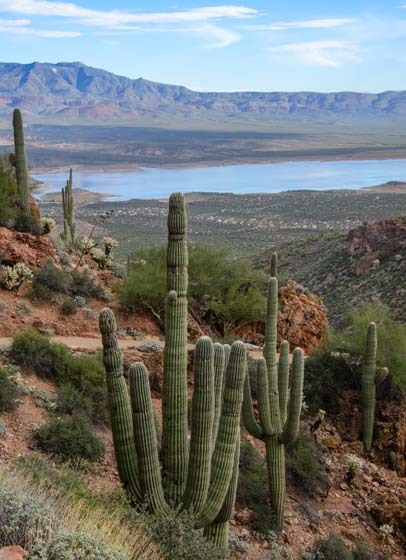 Tonto National Monument AZ – Workamping with the Ancients! 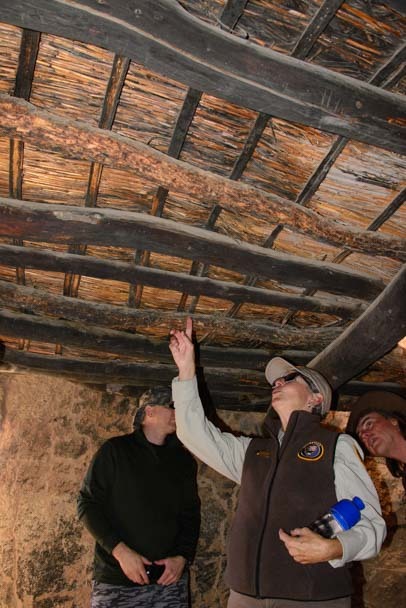 December 2015 – During our RV travels in central Arizona we took an outstanding volunteer-led tour of the ancient Indian “Upper Cliff Dwellings” at Tonto National Monument. 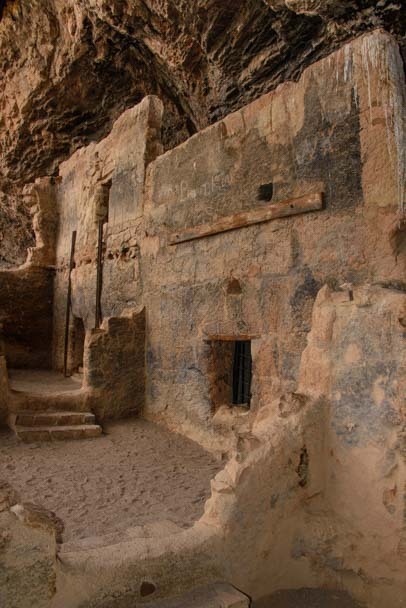 We had already visited the “Lower Cliff Dwellings” on our own, as those are open to the public for exploration without a guide. 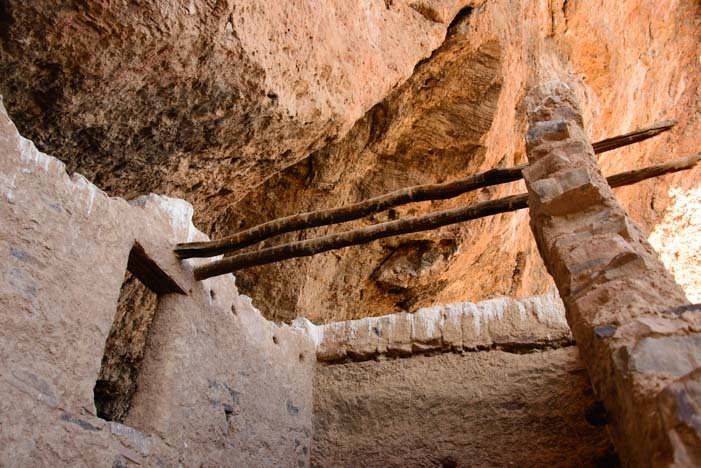 But a visit to the Upper Cliff Dwellings can only be made if you take a guided tour. 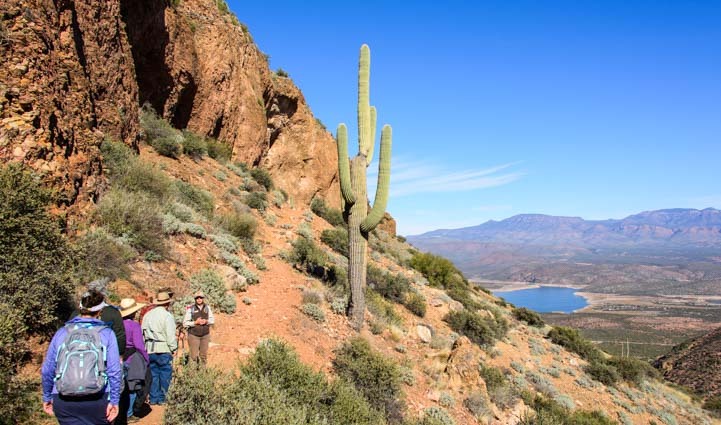 The hike up to Tonto National Monument’s Upper Cliff Dwellings goes through some beautiful scenery. 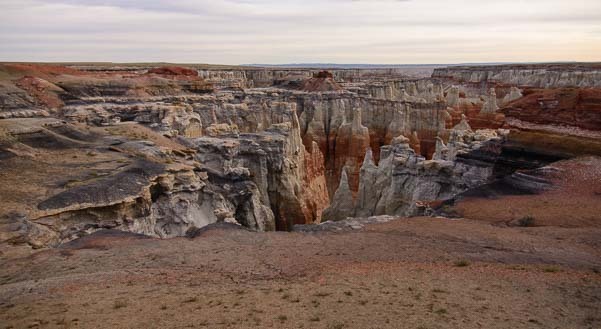 The cost was just the price of admission to the National Monument ($5 per person or free with a Federal Interagency Pass or Senior Access Pass). But that low cost was deceiving — this was no ordinary tour! The depth of knowledge and enthusiasm of our guide, Susan Treneer, as she taught us about these ancient Indian ruins was unbelievable, and our whole group was fascinated as we listened to her explain the theories behind the history of this special place. The hike was uphill but not too strenuous. A group of about eight of us gathered at the Visitors Center and then hiked the 3 mile round trip up the steep hillside to the ruins and back. We began by going through some lovely riparian habitat (wetlands) where sycamores and other hardwoods were still showing off their autumn color. 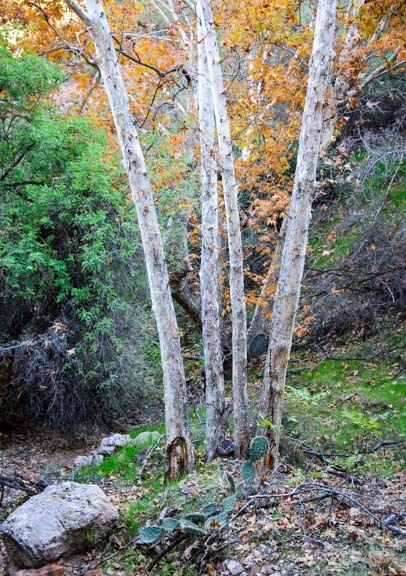 A sycamore tree just off the trail in a riparian area. Periodically, Susan stopped us as we hiked to explain the different vegetation we were seeing and to talk about the people who lived in the Tonto Basin 700 years ago. Susan pauses to tell us about the Salt River and the people who lived here centuries ago. 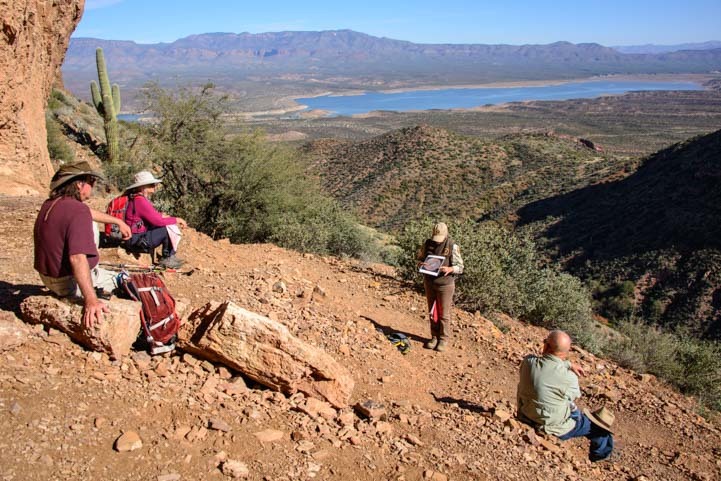 We climbed higher and higher on the hillside as we approached the cliff dwellings at the top, and the view of Roosevelt Lake grew more and more expansive below us. The views of Roosevelt Lake were outstanding. Right before we entered the Upper Cliff Dwelling ruins, Susan brought out photos of some of the astonishingly beautiful and intricate pottery that the people of this place had made all those centuries ago. 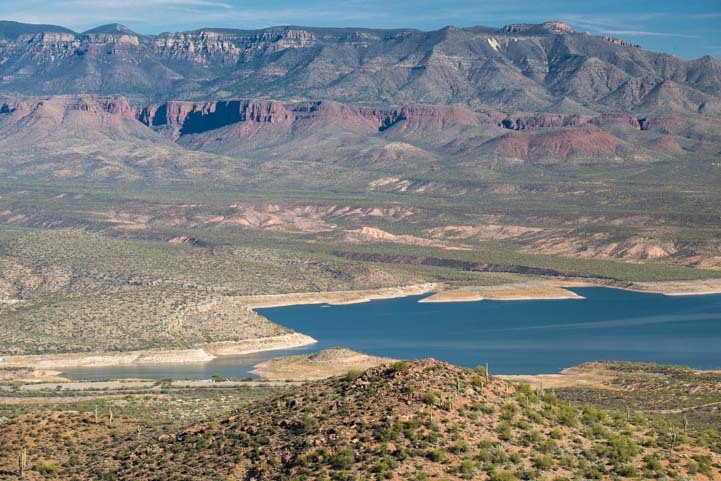 They are called the Salado People by archaeologists today, named for the Rio Salado (Salt River) that they lived near and which was dammed up in 1911 to create Roosevelt Lake. Susan showed us photos of beautiful Tonto Basin pottery made right here centuries ago. The Salado people were extraordinary potters, and their pottery has been found as far away as the Paquimé ruins in northern Mexico, some 350 miles or so southeast of Tonto National Monument. 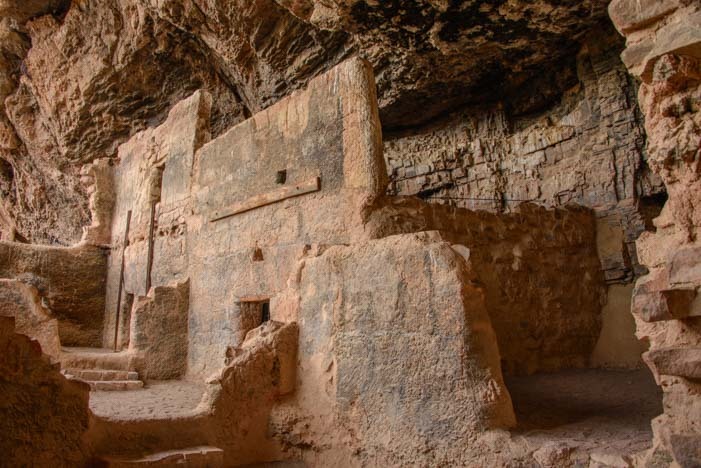 The people who built these ruins came down from Mesa Verde in southwestern Colorado and from other Colorado Plateau cliff dwelling communities. Our guide, Susan, excitedly explained that no one really knows why the Salado built their homes in these caves so high up on the mountainside. She explained that the valleys were already filled with people living an agrarian lifestyle. 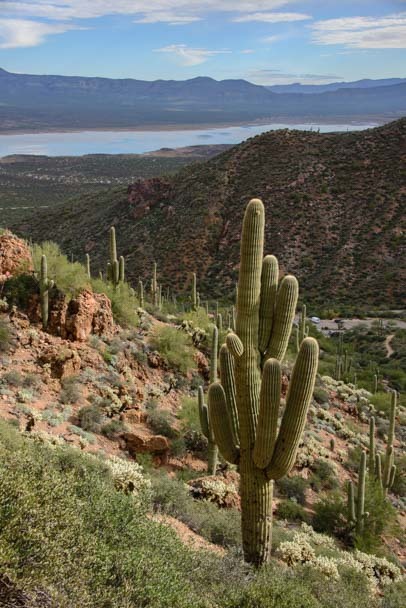 Those old-timers had been raising cotton, beans, squash and corn in the Tonto Basin for 1,000 years already. 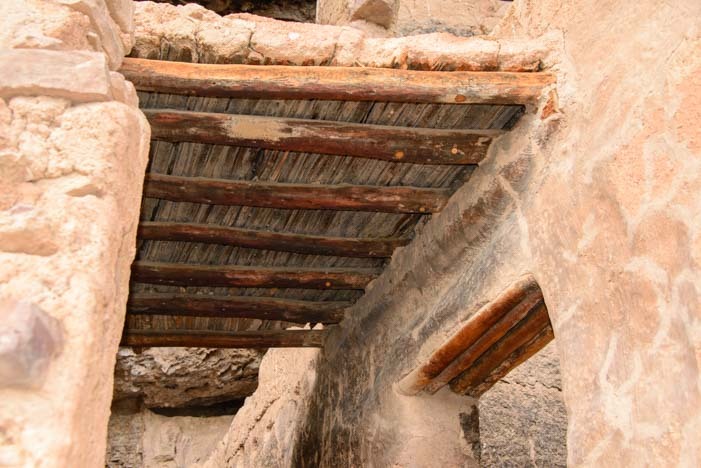 The adobe structures had roofs made of saguaro cactus ribs and juniper. These are original! The cliff dwellers were the newcomers to the area. They may have been artisans who wanted to make a life selling their unique tricolor pottery. Or they may have been workers for the wealthier farmers who lived below them. No one is 100% sure! 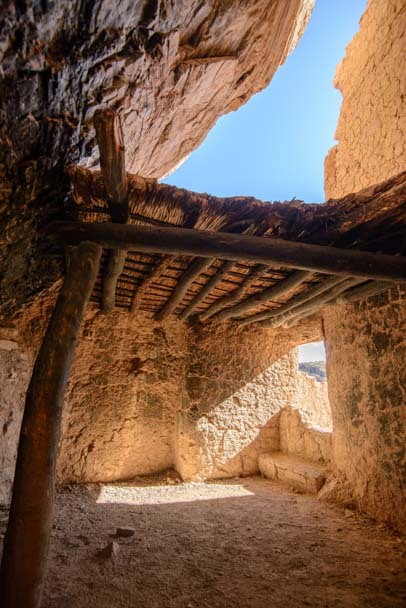 The adobe homes, storage rooms and workshops were built right into the caves. 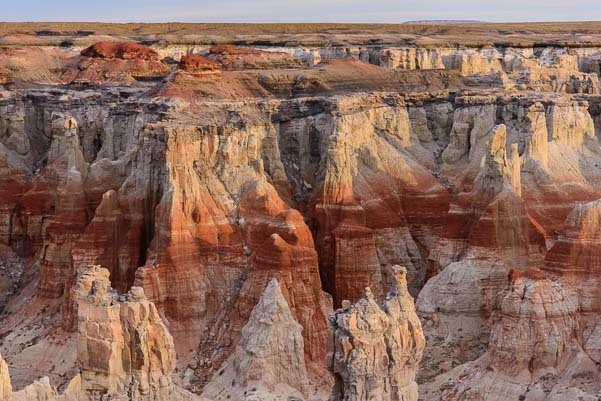 All that is known is that they came down from the Colorado Plateau, and traveled through the Kayenta, Arizona, area, and ultimately set up housekeeping in the Tonto Basin and stayed for about 100 years. Susan was extraordinarily knowledgeable about the ancient southwest cultures. Susan’s enthusiasm for the subject was infectious, and it struck me that she was absolutely loving her wintertime volunteer job with the National Park Service at this special spot. For archaeology buffs, working at a site that is being actively studied by scientists must be a thrill. In between describing the tools and other relics that have been found at Tonto National Monument, she also told us that archaeology has been her lifelong interest. 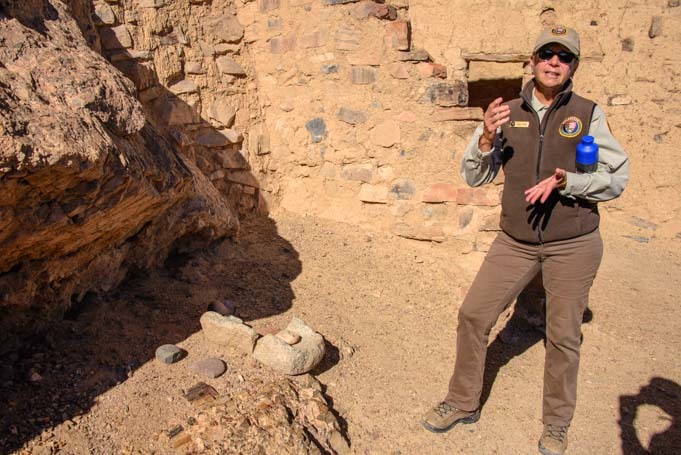 She hadn’t studied it formally or been a professional in the field during her career, but now, as a retiree, she was able to work alongside scientists and archaeologists studying this site and stay on top of the most recent findings and theories while “on the job” with the National Park Service. How cool is that?! as well as all over the southwest. Susan’s volunteer job requires 32 hours a week of work, and she has taken the position for a few months. 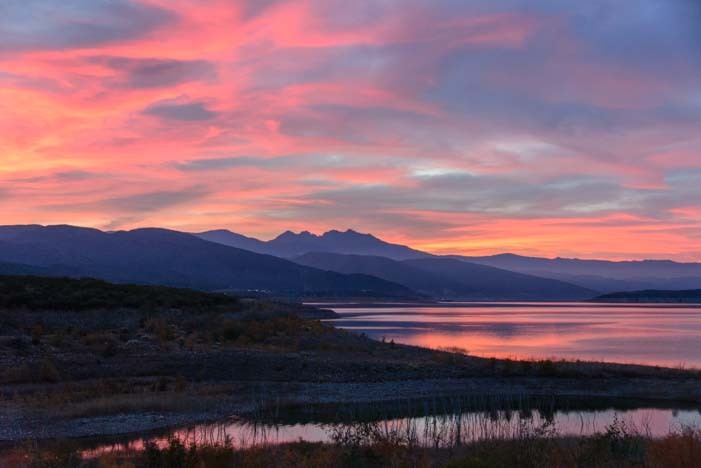 In exchange, she receives an RV campsite with full hookups overlooking Roosevelt Lake. This may not sound like a very fair exchange if you multiply out the hours worked and the value of the campsite. Even if it were a resort campsite, like nearby Monte Vista RV Resort with its swimming pools, hot tubs, sports courts and art studios, the pay would equate to just $8.20/hour. However, there is a deeper meaning to doing this kind of work, and she was obviously thrilled to have the opportunity to learn about the ancient southwestern cultures in a professional setting and to share her passion with others. 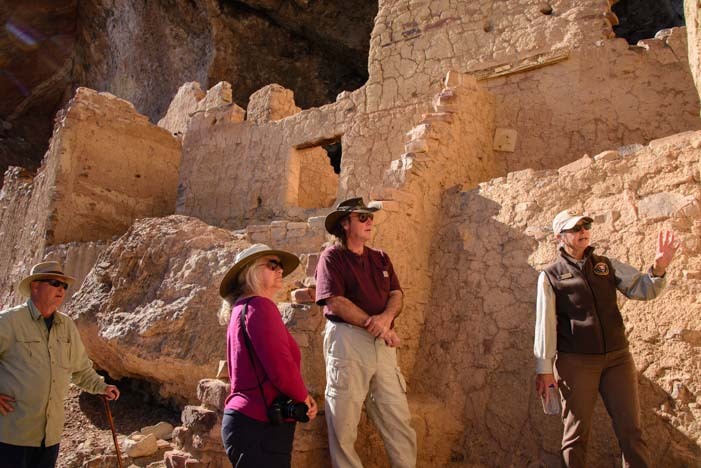 The public can only see the Upper Cliff dwellings on guided tours given on weekends. Susan told me she has volunteered for the National Park Service for several years and has held similar positions at a few of the most significant ancient cliff dwelling ruins sites across the southwest, including Mesa Verde, Chaco Canyon and the Gila Cliff Dwellings. In one job, she didn’t work with the public but spent her days cataloging and storing ancient pottery. She said that having the opportunity to hold, examine and study 700 and 800 year old pots — some of them perfectly intact — was just thrilling. These ruins were overflowing with artifacts and debris when they were first studied 100 years ago. In those days tourists were free to take home whatever artifacts they found lying around! I asked Susan how she got started with the National Park Service, and she explained that when she started as a volunteer, she had to undergo an intensive 40 hour training class and also do a beginner’s stint as a campground host at Big Bend National Park (not her favorite line of work). But it was clear that the personal rewards she has found since starting work at the various cliff dwelling sites have been enormous. The Salado people weren’t all that short — 5’6″ was average for men, the same as their counterparts in Europe – but the floor of the caves has built up over time. 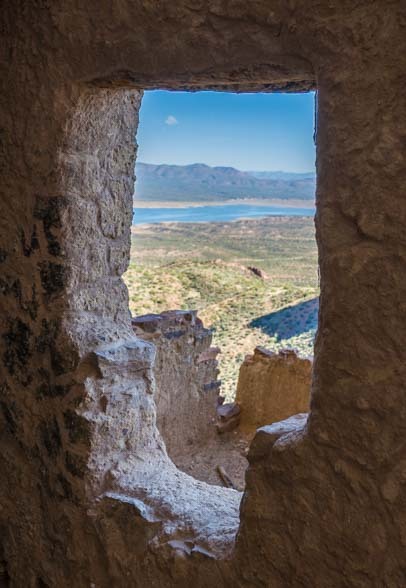 Her enthusiasm for all things ancient and puebloan — like the small “T” shaped window that looked out from the window onto modern day Roosevelt Lake where the free spirited Salt River once irrigated the farmlands — was truly infectious. The “T” window shape was used by the ancients in many places. We remember seeing this shape at the Mayan ruins in Palenque in southern Mexico. Lots of folks think “work camping” is simply working as a campground host checking people in and out of a campground or cleaning the bathrooms. 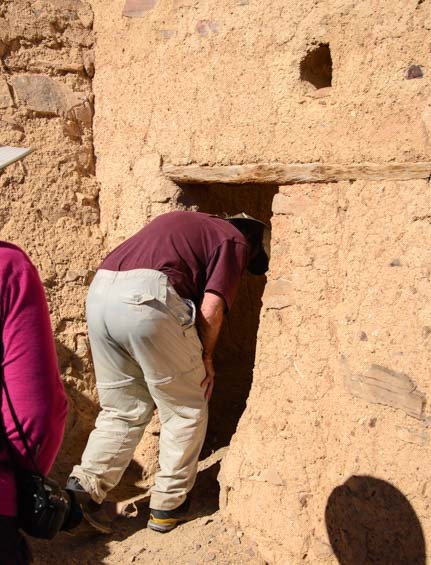 But as I learned from Susan, if you have a passion for a particular field of study that is a focus of a particular National Park, like the puebloan culture and associated archaeological ruins, volunteering is a fabulous way to apprentice yourself to get hands on experience and learn everything you can. Susan pointed out a “matate” grinding stone that remains on site. When Susan started, she was given a two page reading list of books to study. She was thrilled. “I like the intellectual stimulation,” she said. She wanted to spend her retirement not just traveling but learning new things and expanding her horizons in every way. Corn was similar but a bit smaller back then. 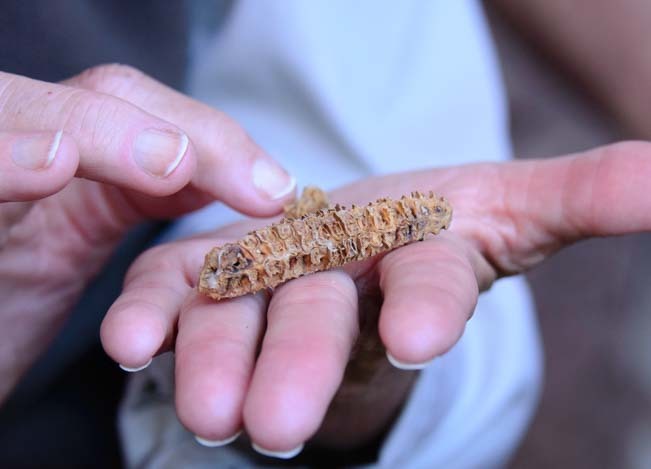 This corn cob is 700 years old! More than once she mentioned the names of the archaeologists who are her favorite mentors. They are pioneering new work on the origins, migrations and lives of the ancient people of the southwest, and some of their theories challenge those of the researchers of prior decades. So, their work is new, their ideas are fresh, and they are breaking new ground in understanding what the earlier people of the southwest were really all about. 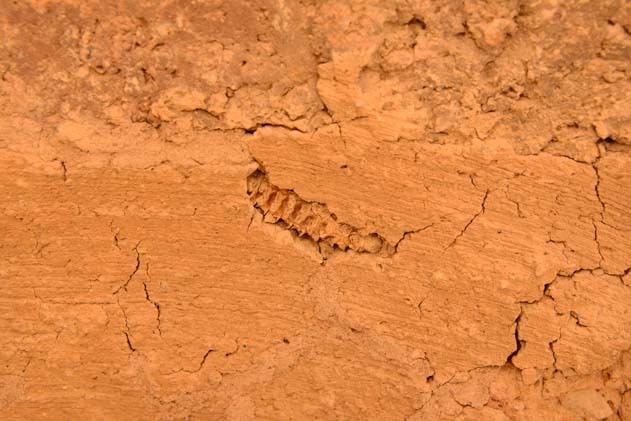 A corn cob got mixed into the adobe mud during construction and ended up in a wall! We were totally impressed by the high quality of this tour. It felt like we were on a guided field trip with a true scholar. 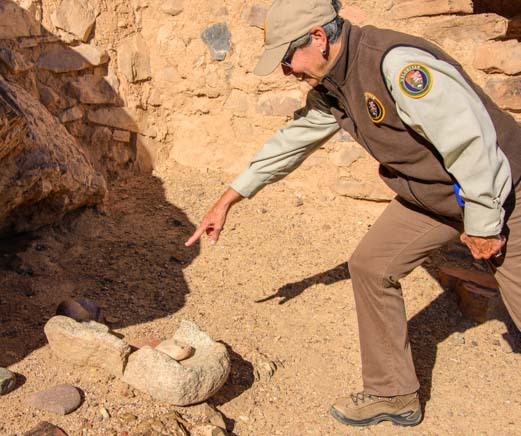 Susan had brought materials with her to show and instruct us, and she pointed out relics that were found at the Upper Cliff Dwellings and remain onsite and that the public can’t see without a guide. Best of all, she gave us insights into the lives of the people of an earlier time. The remains of a shovel used by archaeologist Charlie Steen during the 1930’s excavation of these ancient ruins. Perhaps even more important, she opened our eyes to the kinds of volunteer work that are possible within the National Park Service and on public lands in general. It isn’t always just cleaning up after tourists! Susan did say, however, that there is a lot of competition for the premium volunteer positions, and that you have to build your credentials and your resume, just as you would with a paying job. After all, they aren’t going to trust just anyone off the street with handling and cataloging priceless pottery that is centuries old! 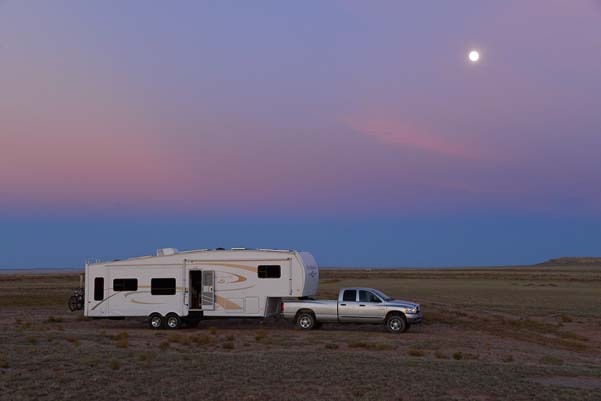 But once you get yourself established in the system, there are intriguing opportunities to learn and to share — and to get an RV campsite with a view too boot! 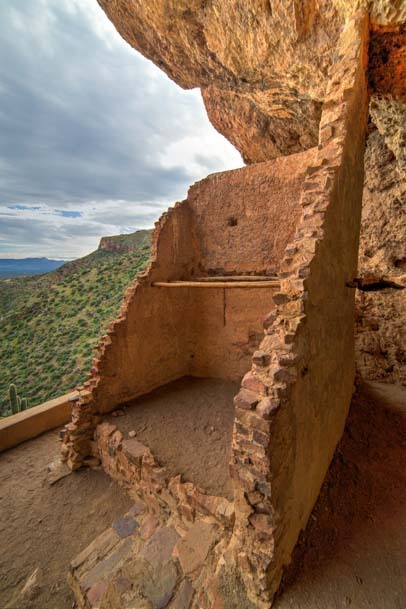 If you have a chance to travel to central Arizona with your RV, take a trip to Tonto National Monument in the Tonto National Forest and see these wonderful ruins. 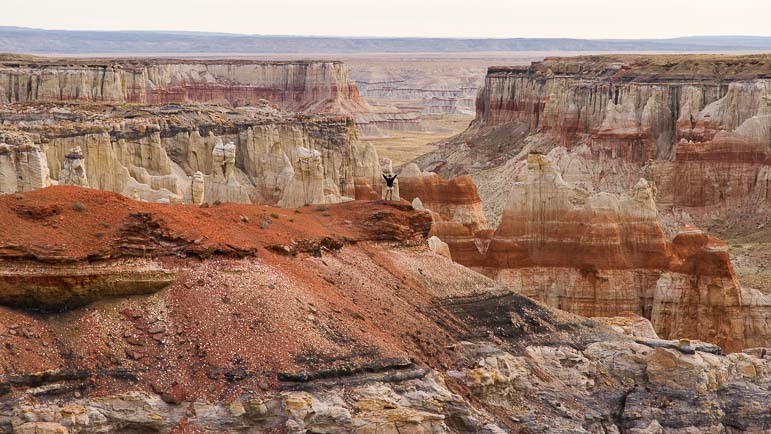 If you are lucky enough to be able to RV seasonally or full-time as a retiree, perhaps you too will pursue a lifelong interest by taking a short term volunteer position on America’s public lands! There’s more info and links below. 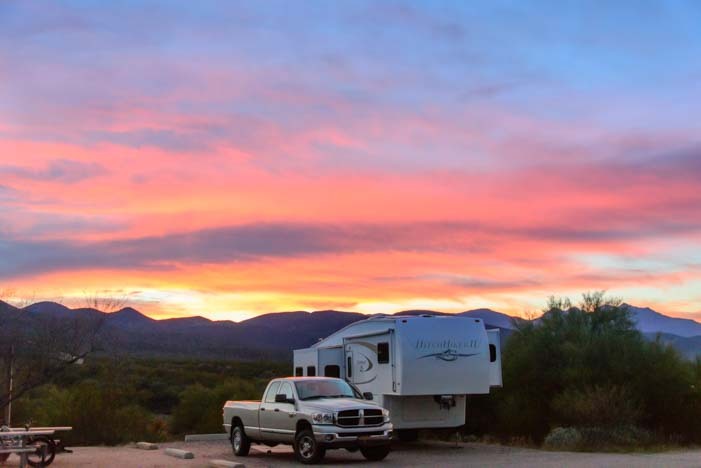 December 2015 – One of the treasures in the Sonoran Desert in Arizona is the exquisite sunrises and sunsets that light up the sky in vivid shades of pink and orange. 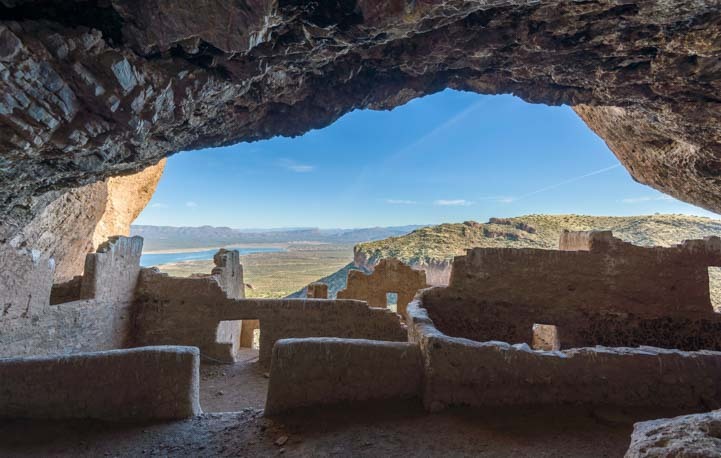 Another treasure that lies inside the Tonto National Forest near Roosevelt Lake high up on the mountain sides is the Tonto National Monument ancient Indian cliff dwelling ruins. 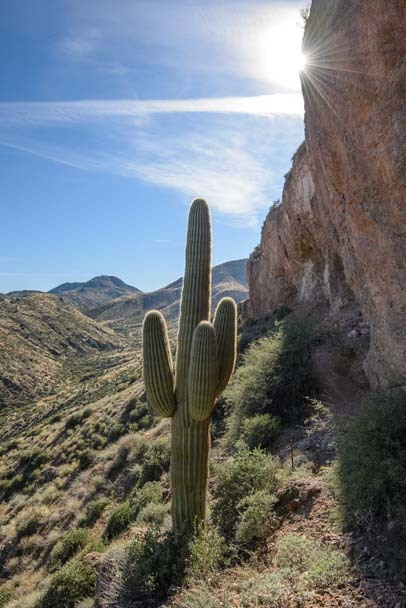 These ruins, built by the Salado people around 1300 A.D., are surrounded by saguaro cactus that stand so thickly on the hillside that, from a distance, they seem to transform the landscape into a pincushion! Up close, however, they are very tall. 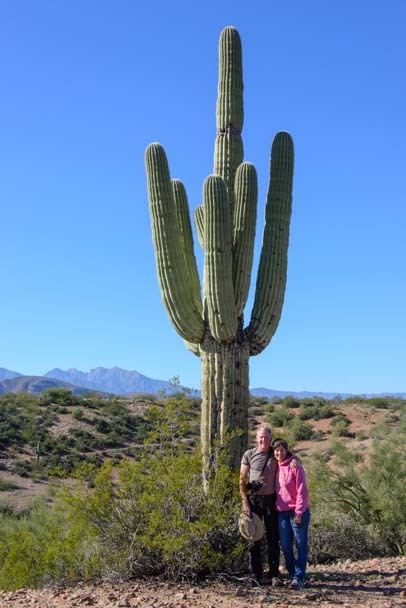 Saguaro cactus are very tall plants! One of the best things about visiting the Tonto National Monument cliff dwellings is the half mile uphill hike to get to them. A narrow paved path takes numerous switchbacks up the hill, passing by dozens of beautiful saguaro cactus on the way to the ruins. 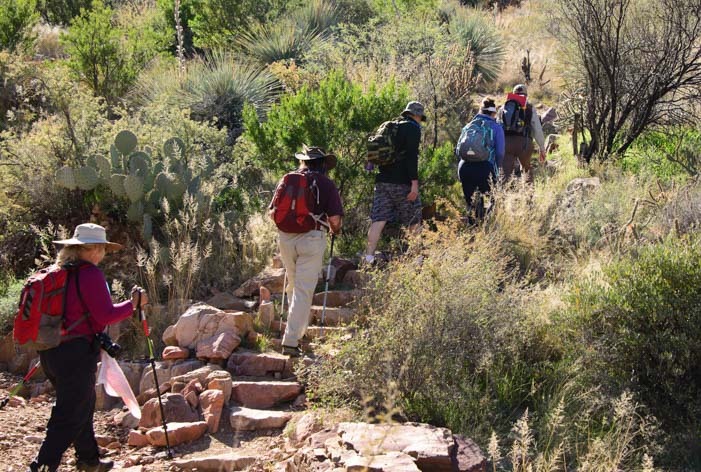 It is a half mile hike on a paved path through lush Sonoran desert to get to the ruins. 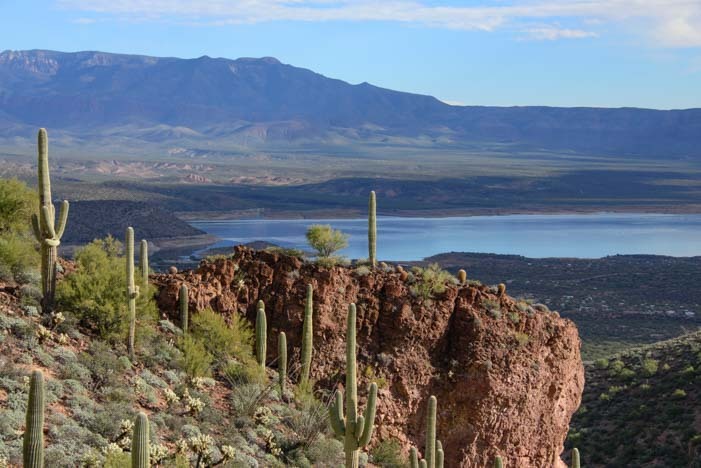 As the path climbs ever higher, the view of Roosevelt Lake down in the valley grows ever wider. Then the ancient ruins appear, built into a huge cave in a sheer rock wall cliff face. It is startling, after climbing up through all the natural vegetation of the Sonoran Desert, to come face to face with the remnants of a distant culture’s masonry creations. The current theory is that the 20,000 or so Anasazi people who had built and lived in the immense Mesa Verde cliff dwellings in Colorado had left there for some reason and moved south, a few of them making their way through northeastern Arizona to the Tonto Basin to live here. As a point of reference, in this same time period over in Europe, Florence had become the heart of commercial and cultural activity, and the Renaissance (the rebirth of interest in classical literature, art and music) was in its earliest stages. 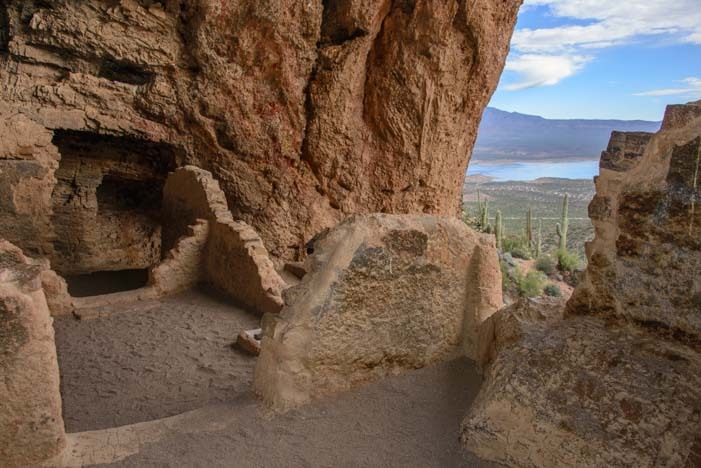 At Tonto National Monument, the 700 year old walls are still standing, although they have broken down over time. With a little imagination, we could visualize the structure as it once stood as we moved from room to room. There were quite a few rooms, most of them quite small, just 8′ square or so. The rooms near the front of the cave have a view across the valley to the lake. The ruins are built into a huge cave. The outer rooms have an incredible view! Little openings led from one room to another, and the rooms stretched to the back of the cave. The cave faces east, so after about noon, it is shaded and cool, even in the blistering heat of mid-summer. 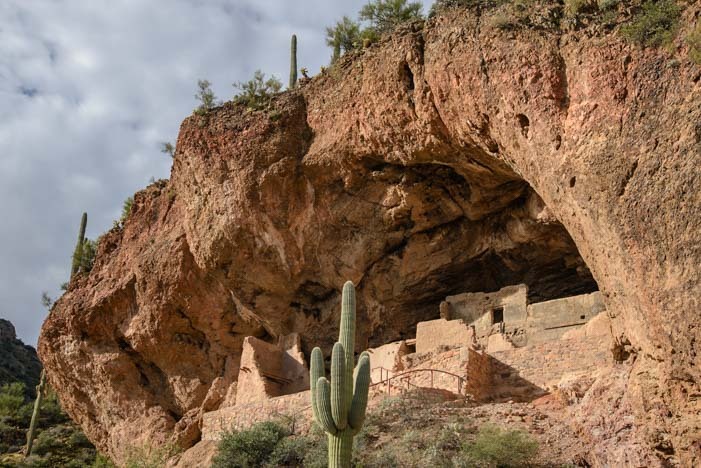 Tonto National Monument has two sets of cliff dwellings that are open to the public, the Lower Cliff Dwellings and the Upper Cliff Dwellings. 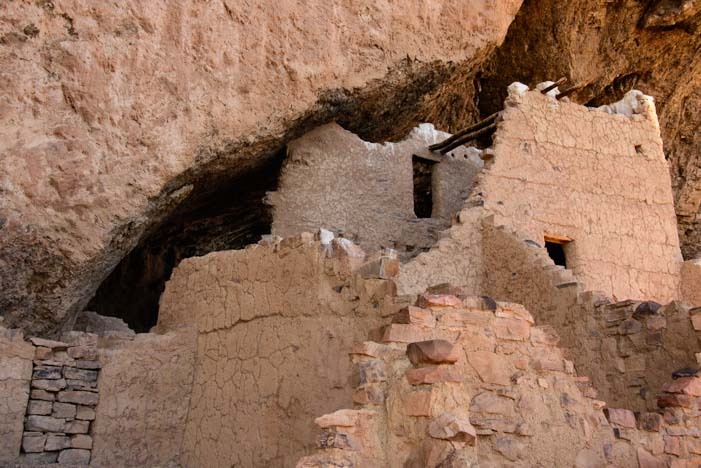 Even though the Lower Cliff Dwellings are slightly smaller, the fun thing about them is that you are free to explore them at your own pace and they lie just 1/2 mile from the visitors center. A few roofs made of juniper logs and saguaro ribs are still intact. It’s a fairly steep hike to reach these ruins, but it is short, and the views along the entire trail are just wonderful. Even if you’re not into ancient Indian stuff, the views are well worth the hike. 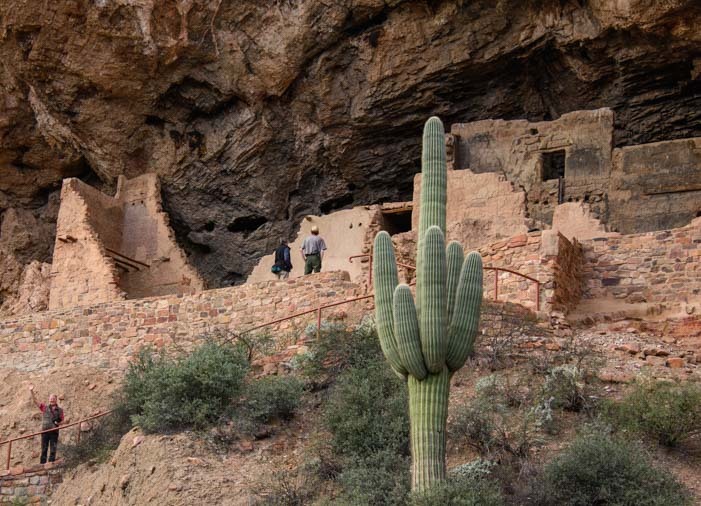 The hike to the Upper Cliff Dwellings is about 3 miles long, and those ruins are open to the public only on guided tours on the weekends. We took that hike too and will share photos in an upcoming post. 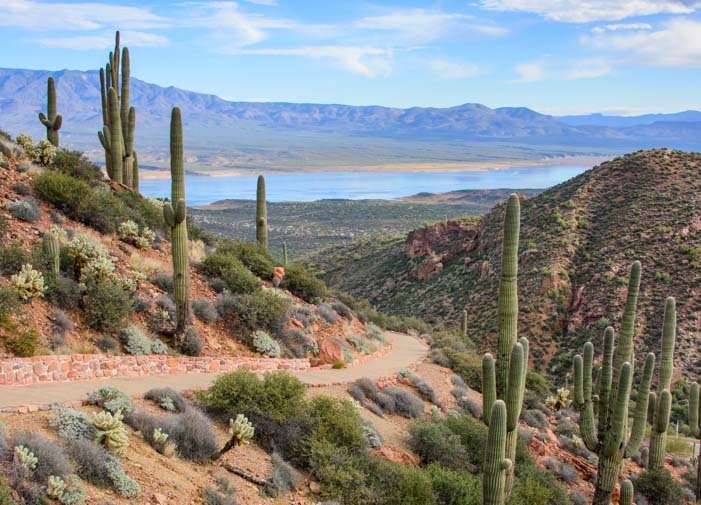 Tonto National Monument makes a terrific daytrip from the Mesa and eastern Phoenix area, and it is an absolute “must see” if you are camping at one of the campgrounds at Roosevelt Lake. 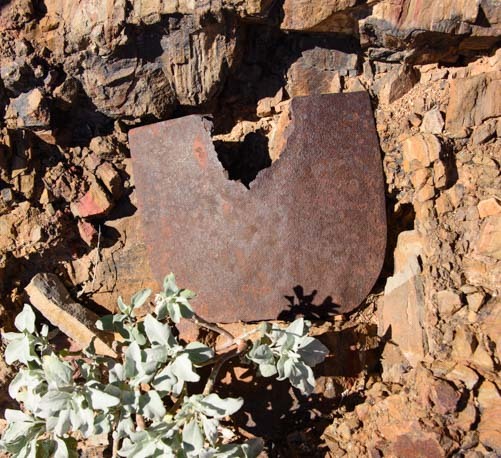 A word of caution to travelers taking a big RV to this area: The once stunningly scenic drive along US-60 from Superior to Globe is now a chaotic nightmare of construction (probably in preparation for the world’s largest copper mine that will be built between the two towns). 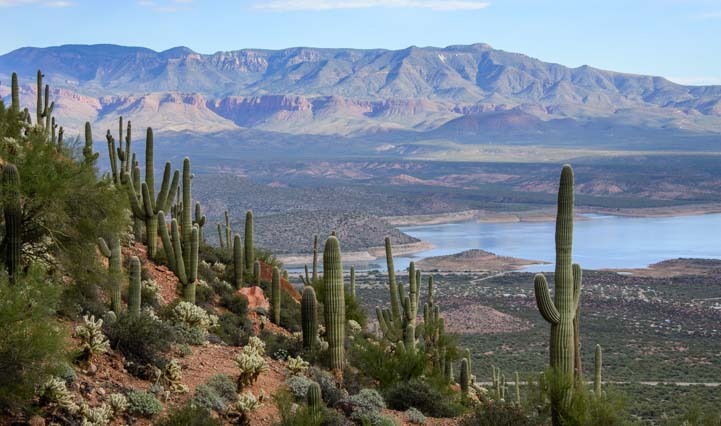 Even though the distance is 10 miles longer, it is a much less stressful (and also very scenic) rout to take SR-87 (the “Beeline Highway”) from Fountain Hills north to Punkin Center and then go south on SR-88 to Tonto National Monument. One of the biggest highlights of attending the photo workshop put on by Photography Life in Colorado this past fall was meeting pro photographer John “Verm” Sherman and, a few weeks later, his pro photographer girlfriend Dawn Kish. Dawn is a contributing photographer for Arizona Highways and she shoots for National Geographic as well. Her photography is so unique that one of her photos was selected by National Geographic Traveler as being among the Top 30 photos of the Last 30 Years. Wow!!! Better yet, she is a vivacious and fun-loving woman who spends her leisure time rock climbing and mountain biking. We were lucky enough to camp alongside her and Verm recently. When I told her we had just done some exploring in the Navajo Nation, she told me she had just finished an assignment making a video of the Navajo Nation Fair. Suddenly, she plopped her laptop on our table, set up our two chairs to face it so we could watch, and brought up this incredible video. I don’t know much about the Navajo (whose name for themselves is not Navajo but Diné). They are a very private people, and like indigenous people on every continent, they have been continually challenged to try and integrate into the society that enveloped them while hanging onto their traditions. Dawn’s client asked her to make a video that honored the Navajo, and the result is both evocative and moving. She has captured their spirit and essence beautifully, and I had tears in my eyes as I watched a young Navajo girl dressed in full ceremonial splendor singing the American National Anthem — in Navajo. Enjoy this beautiful glimpse into the lives of a special people whose roots in Arizona go back hundreds of years. It is ten minutes long and the link is below. Putting it in full screen is best! If you are prompted for a password, it is Dine. A few years ago, we watched a fabulous PBS “Independent Lens” documentary of a young Navajo girl who participated in the Miss Navajo Pageant, a competition that tests teenage Navajo girls’ mastery of women’s Navajo traditions, including slaughtering a sheep and speaking the language. 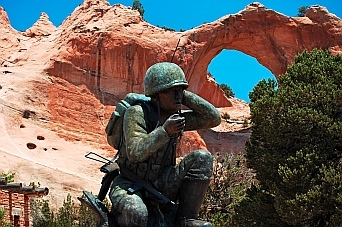 After seeing this PBS documentary, we traveled through Window Rock, Arizona, and saw their unique memorial to the Navajo Code Talkers. I picked up a fantastic book that gives a little insight into the Navajo, their patriotism to America and the unique (and arguably tide-turning) role they played in the Pacific theater of WWII: Search for the Navajo Code Talkers. Yaxchilan and Bonampak – Haunting Ruins in the Jungle. Click here for more Quick Pic posts!! 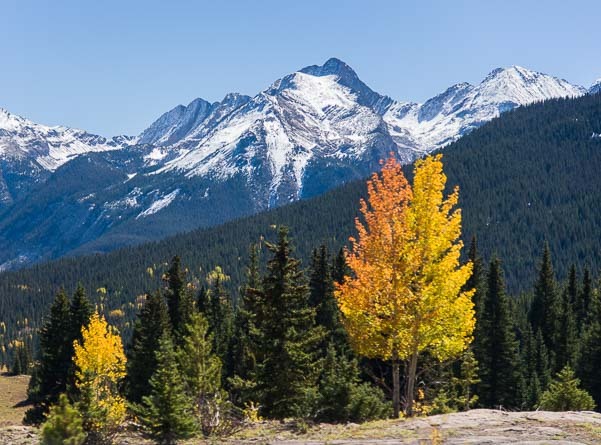 October, 2014 – The snow in Ouray, Colorado, had transformed the surrounding national forest into a winter wonderland. Each night we looked up to see a dome of sparkling diamonds in the sky. This was a perfect chance to do some astro-photography, and one night Mark got out all his camera gear and his jacket, hat, boots and mittens before going to bed. Even our water bottles were dusted with snow! 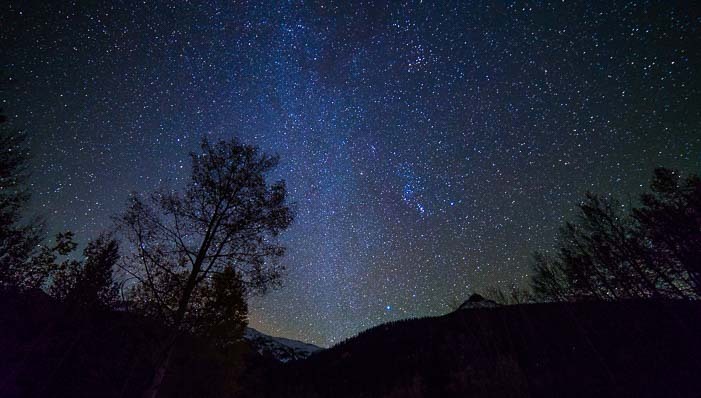 Sometime in the wee hours, while I was groping around for another blanket to pull over my head, he snuck outside and got some beautiful photos of the Milky Way and shimmering sky. Another snowstorm delivered another dusting of the white stuff on everything, and we decided we had shivered enough. 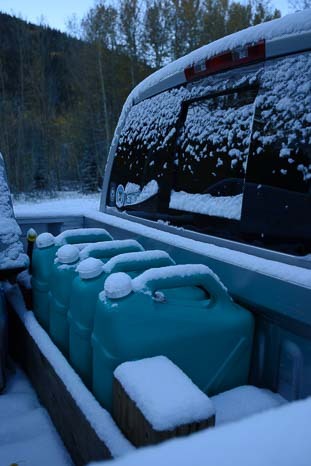 As that night’s snow melted during the morning, we packed everything up, hitched up the buggy and started to pull out. Our views on the Million Dollar Highway were spectacular. Well, we TRIED to pull out! The nice soft dirt that had been under the fifth wheel’s tires when we first set up camp had transformed into thick gooey mud. Despite putting the truck in four wheel drive, the tires spun like crazy, flinging mud far and wide and splattering the whole front of the trailer. But the trailer didn’t budge! Mark grabbed our shovel and piled dry gravelly dirt in front of each of the truck and trailer tires. Nature was showing the last of her vibrant fall colors. After a few groans from the hitch, the rig slowly began to move. We were on our way. 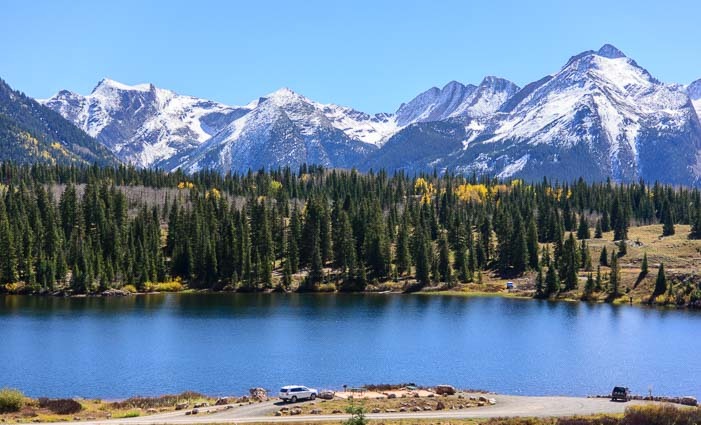 We drove up and over 11,000′ Red Mountain Pass into Silverton and then over two more passes before we dropped down into Durango. The truck was working hard as it pulled our house along, but it made it through the three big climbs and descents just fine. Mark had recently installed a K&N air intake and an Edge Tuner, and these gave the truck a huge power boost on the many 10% grades. The scenery was gorgeous, and it was bittersweet to leave the glowing aspens and snow-capped peaks behind. But the red rocks of Arizona’s Indian country welcomed us. We were on a mission to get to Phoenix, Arizona, so we didn’t dawdle anywhere. 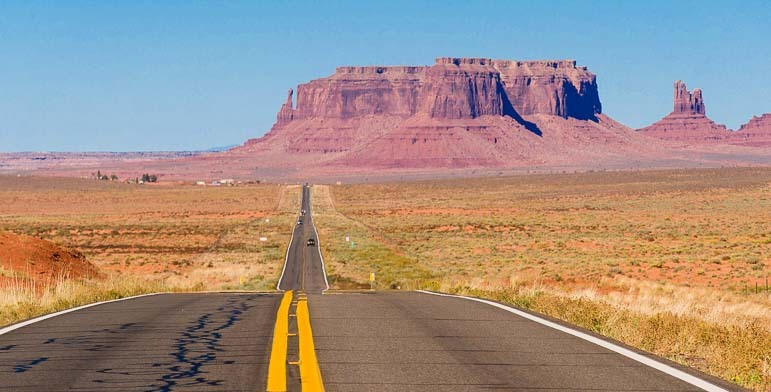 However, when the turn-off for Monument Valley slipped by, we did a U-turn and circled back to drive a short ways out on spectacular Route 163 towards the valley. We hadn’t done that drive in many years, but it was just as dramatic as we remembered it being. This is an iconic place, and lots of Hollywood movies have been filmed among these famous rock formations (see a list here). 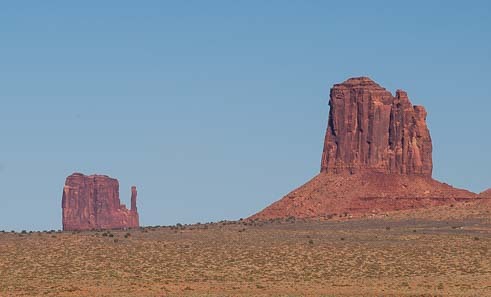 Monument Valley is famous for its mitten formations. We had recently watched John Wayne’s black and white 1939 classic film Stagecoach and his 1956 film The Searchers which pretends this incredible landscape is in Texas! A full moon appeared at sunset. Seeing these monoliths for real on the horizon was breathtaking. The road into Monument Valley is dotted with simple little structures where Navajo Indians sell their jewelry, pottery and other crafts. 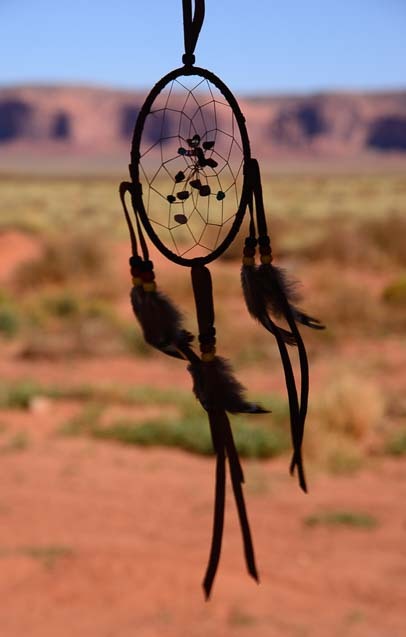 A dreamcatcher fluttering in the wind at one of these open air booths caught my eye as it twisted and turned against the backdrop of the distant red rocks. I got chatting with the very friendly woman who was selling these trinkets. Cows appear on a ridge. I remarked that she had quite a spectacular view out her “office” window and she smiled and joked that her twenty mile commute along these roads wasn’t too bad either. 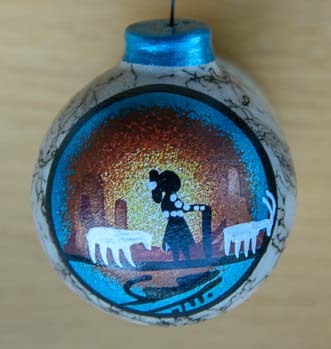 I soon found myself picking out a beautifully painted ceramic Christmas ornament. I looked at the ornament in my hand. It occurred to me that even though we have driven through the Navajo Nation many times — it takes up a good 15% of Arizona in the northeast corner of the state — we didn’t know much about the people or culture that reside here. Outside the craft shop two old Indian women stood talking together — in Navajo. I tip-toed past very slowly, trying to catch the sound of their language that flowed so easily and freely between them. Guttural, staccato and clipped, it sounded like no other language I’ve ever heard. “We really need to spend more time here,” I said under my breath to Mark as we got back in the truck, wishing we could stay and get to know these people a bit and learn a little more. Before I knew it, he’d taken a turn off the main road, and we were bumping down some side road. He had us on a crazy detour that was taking us far from the busy Route 160 that zips through the center of this land between Cortez, Colorado, and Flagstaff, Arizona. We drove along a variety of back roads, watching unusual rock formations rise and fall around us as the traffic grew lighter and lighter. Suddenly, the land fell away in front of us. 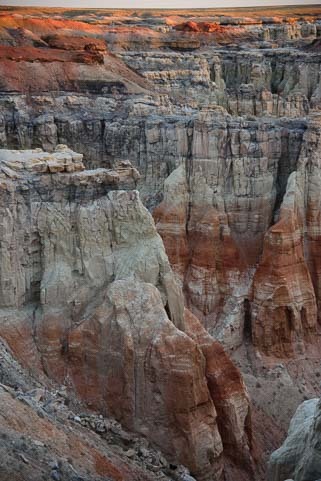 We were standing on the edge of a rainbow canyon that stretched vast and wide before us. 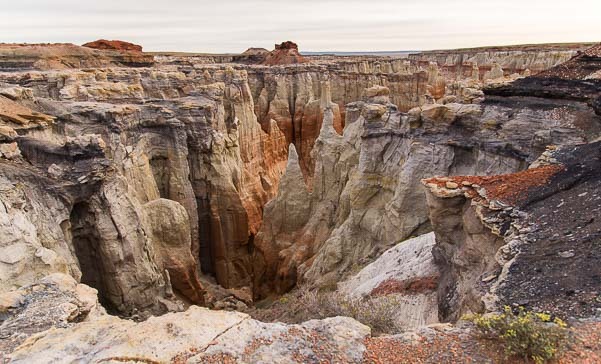 We ran out to take a closer look and found ourselves staring out at a massive bowl of towering hoodoos made of pink and red and white striped sandstone. 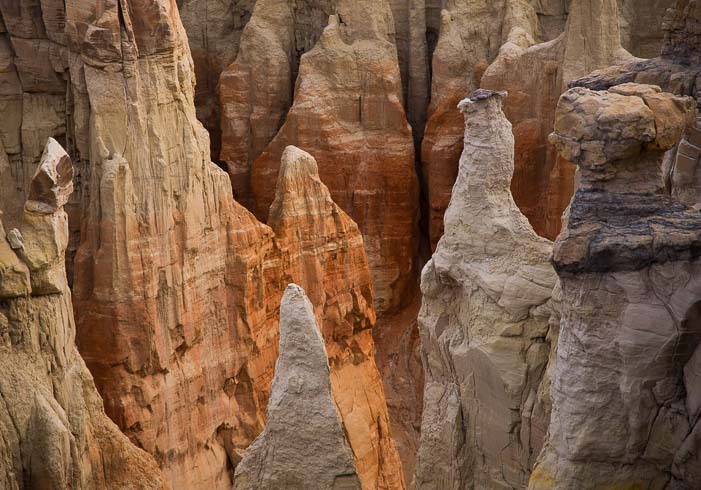 The spires were a thousand feet tall and the canyon stretched to the horizon. What a beautiful and mysterious place. From what I’ve read, the Navajo are reserved and private people, and they aren’t quick to reveal the secrets of their lives. How fitting that an exotic natural treasure like this lies hidden in the vast wide open plains on their land, unmarked and unfettered by the trappings of civilization. We watched in awe as the sunrise slowly lit the canyon with a gentle glow. I wrote this post over Thanksgiving weekend, and an observant reader reminded me that Thanksgiving was, of course, a celebration shared by the Indians and the pilgrims centuries ago. The celebration took place in the fall of 1621 in Massachusetts, likely at the end of September, and was attended by 90 Wampanoag Indians and 53 pilgrims. The Navajo were a far distant tribe in Arizona, but they shared a similar spirit and heritage with the Indians of the Atlantic coast. All our posts from Arizona: Here! for Oklahoma's Red Earth festival. A homeowner with a flair for color. The land was painted pink too! Looking down Canyon del Muerto. Sheer cliffs and lush valleys. The little cave to the left. The immensity is hard to capture. Tim & Mary Lynn look across at Mummy Cave. The structure inside Mummy Cave. bottom of this massive cliff. Close-up of Antelope House ruins. Looking down on the lush valley floor. The swirls dwarf the trees in the middle of the pattern. We take a breather from hiking. The bottom of the canyon is flat and wide. a ground-level building & a cave dwelling above. 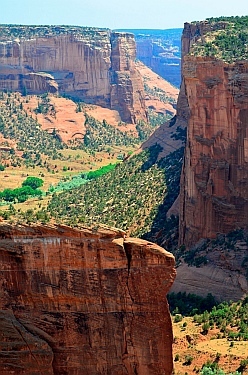 A Navajo hogan backed by dramatic cliff walls. TV weather forecasts with very cool temps. front of the big window in the rock. the group was very excited. commanders credited them with saving countless American lives. "Were it not for the Navajos, the Marines would not have taken Iwo Jima." Window Rock. Huge red rock cliffs lined the sides of the road. orchards in the 18th and 19th centuries. us, the only sound was our own breathing. Even the wind stood still. women, children and old men. 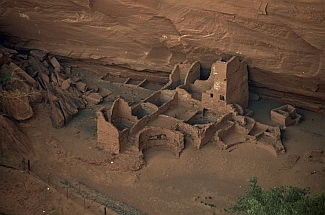 structures that the Navajo hid in. especially with the Spanish after you. do you show it all?? a lot like we do by boondocking on public lands. off, Mary Lynn enjoyed web design too. What a crazy coincidence!! dwelling in just the right light! anyways and hoped we'd run into these guys again somewhere. place to build a house! dolls. They can't possibly be real. then the ruins were long abandoned. canyon to see it up close. fit it all into the camera frame. Sigh. Not possible! path ever deeper into the stone. can way up on the top of the canyon. out along the rock wall. Colorado, possibly the best collection of cliff dwellings in the US. Unusual rock formations line the road. A deer says "hello" at Mesa Verde. Stone masonry from sandstone bricks. They were as good at round walls as straight ones. Communities are tucked under overhanging cliff walls. A closer look at the buildings below. and others on a lower one. A closer look at Cliff Palace. 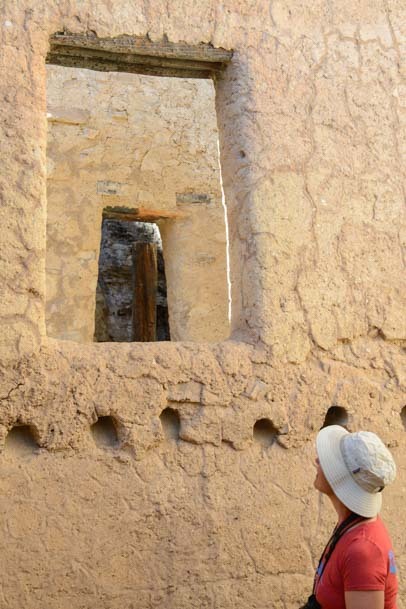 A tour group walks through the Cliff Palace ruins. An above-ground structure at Sun Temple. Landscapes as we leave Colorado and enter Utah. An old truck out back behind Jack's shop. on the trailer - take photos! The round plastic handle was becoming square. Jack and the finished product. How it works and what it does. 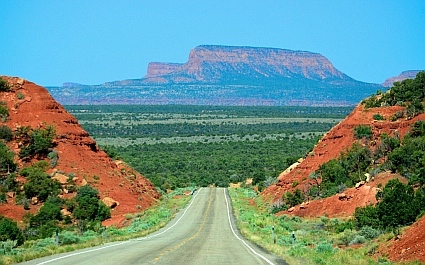 The Bicentennial Highway, Route 95 in Utah. Typical sights along the "Bicentennial Highway"
"Oh oh oh oh -- it's perfect!!" No one for five miles in any direction. 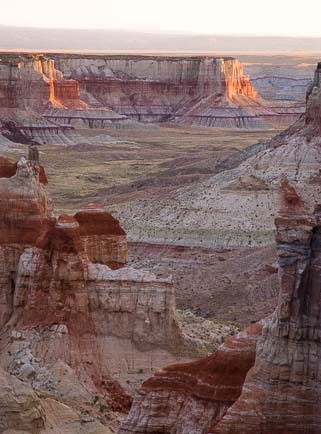 Why we love RVing in Utah. Mesa Verde National Park & Eastern Utah. massive cluster of cave homes lines the canyon walls. floor. But it all looked like a miniature doll house compound down there, far below our feet. 1300 AD, but sadly left no written documentation behind. certainty about the people who built and lived in them. suddenly they become obvious in every nook and cranny. with getting an overview of it all from the top rather than climbing down in. nestled into a cave midway up a rock wall. most unusual signature behind: uneven, jam-packed housing. began to specialize in masonry. not to touch or climb on anything. last six months, and we were ready for a change of pace. way. "Heidi is real happy," he drawled slowly, his bright blue eyes twinkling. had read something about 8% grades). "Oh yeah," he said very slowly. "It's a real pretty drive. dramatic landscapes, and commuting to work on a National Scenic Highway. and the truck ground almost to a complete stop. town by the airport would do a great job for us. every mile of that road." for about the same cost." Go for it!! one of Jack's long-time customers who had just showed up. drive that road all the time. It's pretty." a while it becomes an ordinary backdrop for their lives.